Experience tightening and bounciness from the bubbling of the carbonic acid. Carbon dioxide will form on your skin, producing fizzing and bursting sounds. 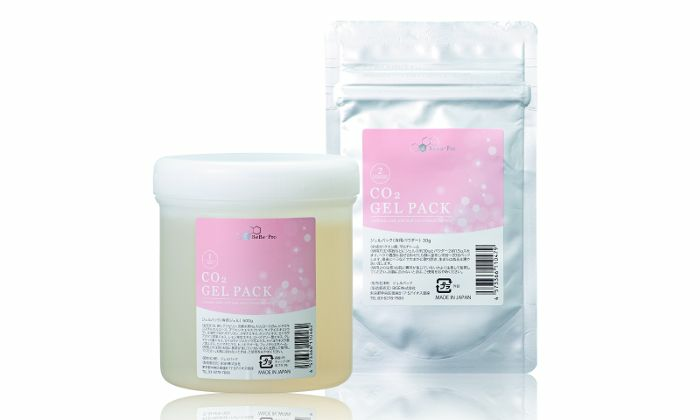 It will promote blood circulation for your skin. It is effective for skin that needs whitening, is dull, sagging, flabby or has acne scars. Use the measuring cup included to scoop out an appropriate amount of gel and powder, and mix them together quickly. Carbon dioxide will start being produced, so spread it generously on your face, avoiding the eyes and lips. After that, massage it in for a while (10 to 20 minutes), then remove the remaining mask with a spatula, and use a clean sponge or towel wet with hot water to wipe off, or wash off with lukewarm water.